It's worth remembering that in his first substantial* passage on the notion that "God is Dead" (The Gay Science, Book 3, Sect. 125), Nietzsche attributes the notion to a "madman" who is addressing not people who believe in God, but people who do not. * It's mentioned in passing in the first section of Book 3 of the same work, but section 125 is the first one in which it is the central subject. The tenth was 1998. And 2010 is on course to be the hottest year on record so far. This is what emergency looks like. H/t to Sully. An "aubade", by the way, is "a song or poem greeting the dawn". If he'd made his name a little earlier, Jeet Heer might have had a chapter of Christan Bök's Eunoia dedicated to him. In the long run, we're all dead anyway. I just found out that Harvey Pekar, the amazing comics writer who specialized in small, autobiographical anecdotes about his daily life as a file clerk, died today. A fabulous movie based on his comics (and, hence, about his life), called by the title of his ongoing comics series, American Splendor, came out in 2003. Some of you may know that for some years now (far too many) I've been working on a graphic novel (illustrating my own script). I'd long harbored a fantasy of sending him a copy once it was done and (FSM willing) published, and saying I'd love to do a story with him if he had any interest in it. I should have worked faster. If you've never read his work, the best place to start is probably the collection of (most of) his collaborations with artist Robert Crumb, American Splendor Presents: Bob & Harv's Comics (1994), which was for me the best work either of them ever did. • David Ulin has a nice appreciation in the LA Times. Since I'm away from my collection of Pekar comics at the moment, and can't go through them looking for a good epitaphial epigraph of my own, I filched one from his piece. • Journalista has posted Gary Groth's 1993 interview with Pekar from The Comics Journal. • As of now, Wikipedia has a thorough article on Pekar's comics series American Splendor; hopefully the publicity of his death won't draw enough attention to it that the powers-that-be at Wikipedia decide to ruin it. • Tom Spurgeon's full-length obituary is here. • Jeet Heer has an obituary here. • Alan David Duane's 2005 interview with Pekar is here. • This blog post by John Glenn Taylor has a nice sampling of random panels from Pekar comics. Satire as a literary device depends on a comprehending and homogeneous audience with commonly understood standards of rightness and reasonableness. Since the satirist can expose to instantaneous contempt only what is readily condemned by the opinion of his readers, he must necessarily be on intimate terms with them and count on their sharing his tastes and viewpoint. If this intimacy should break down, if the satirist's audiences should become heterogeneous and the once-shared values become confused and doubtful, if the satirist has to explain what his ridicule means, then the satire is rendered ineffectual. ...what we see over and over again is that we judge high-road approaches as failures unless they produce nigh-instant and complete favorable results, while we show nearly infinite patience for journeys down the low road. Nine years into the invasion of Afghanistan we have to agree that pulling out after a decade is just too soon. Back in 2001, the Taliban’s failure to turn over Osama bin Laden within a couple of weeks showed the hopelessness of diplomacy. When torture “works” at all it takes weeks and months, just like more classic rapport-building methods of interrogation. And it involves more false positives. Plus, oh I forgot to mention, it is deeply evil. But even though classic interrogation methods produce statistically better results, we live in fear that there may be some time somewhere that torture might get an answer that classic interrogation missed, so of course we must continually torture for that possible moment’s sake. As Gene points out, O’Grady judges the European and Canadian liberation of travel to Cuba a failure because Cuba has not become a neoliberal paradise in the decade since, while leaving aside the fact that Cuba hasn’t become a neoliberal paradise after 50 years of American cold-war against the country. The open question, to me, is who “we” are in the above. American culture, or the human race? I suspect the latter, and that relative power simply gives the US a greater opportunity to take low-road approaches. But I’m not sure. I've been trying to write this post for a few days now. I can't quite figure out how I want to say it. But I feel uneasy not having said it. So I'm going for plain, short and simple. 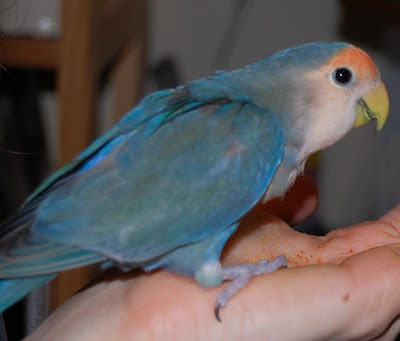 Last week, while my wife and I were away (she had a business trip, I went along) our beloved lovebird Boojum died. He was with a bird sitter, and flew into an uncurtained window. He died instantly. It's hard to know what to say about the death of a pet. The loss is real and powerful, even if those of us who have experienced both would never confuse it with the death of a human being. -- And yet grief about a pet is often scorned or dismissed or mocked -- or, even when this is not true, it is hectored for its triviality (hence the disclaimer in the previous sentence, which I felt compelled to add not because I think it wasn't obvious but despite this). Lived happily and died without pain: thankfully, for Boojum, this is true. It's hard to know what "living a good life" would be for a bird (let alone a human (or is it the other way around? )), but he was happy, as happy as we could make him. He was a strong flier -- or became one: when he came to us, his wings were clipped; but he relearned to fly, and flew frequently around the room when, once or twice a day, we let him out to do so -- a brave little cosmonaut, we thought of him. He explored, and learned to fly in all sorts of complicated and strong ways (almost hovering at times, for instance). At other times he would just circle, for the sheer joy of it. And it is a consolation, if a small one, that he went out flying. Once we returned from our trip -- and brought our surviving lovebird, Snark, safely home again -- we claimed the body; and while our son was with a babysitter, we buried him under a tree, and said, yes, a few words. We have been worrying about Snark -- yet another way we deal with death: fret on the survivors -- but he seems fine, although the day we picked him up he was, understandably, a bit agitated. 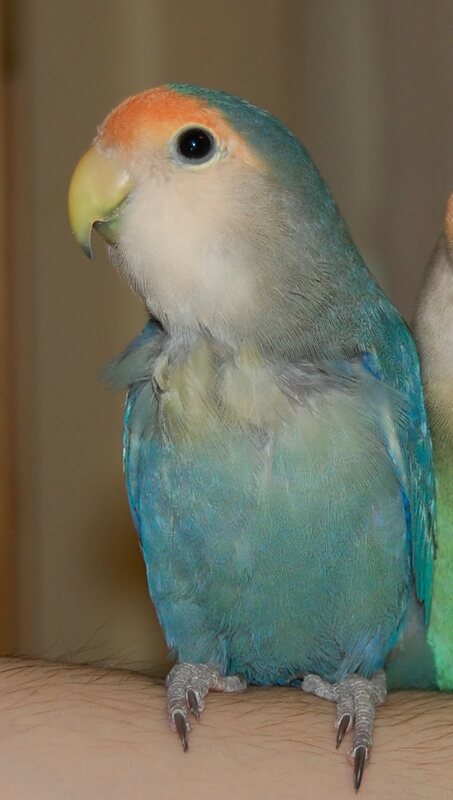 We are hoping to find a new bird to serve as a companion for Snark, since it is not good for lovebirds to live alone (hence the name). But it's hard to believe he does not, in whatever way the mind of a bird does, miss Boojum. Rest in peace, Boojum. Thank you for enriching our lives.